It looked like a cloud clinging to the horizon, some lonely, benign clump of cumulus at the edge of the vast blue expanse of Patagonian sky. But locals made shifty, furtive glances in its direction because they knew better and so did I. That whitish grey smudge came from deep inside the malevolent belly of the earth itself. 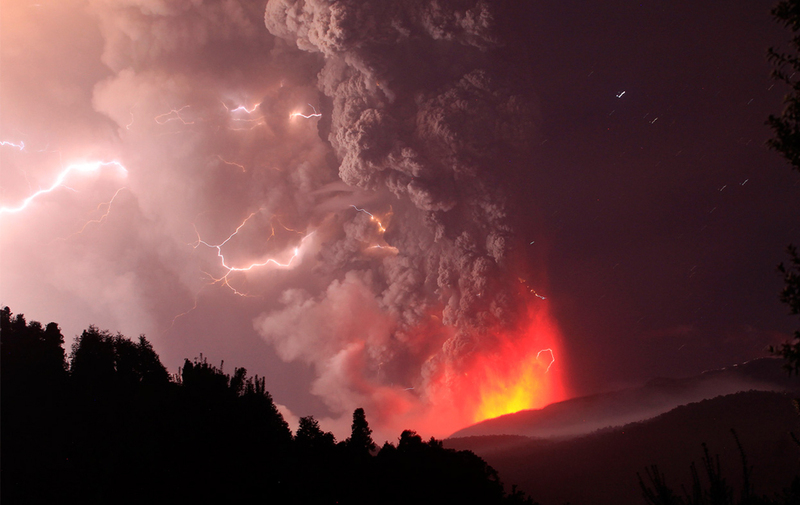 Last June, after laying dormant for half a century a volcano named Puyehue suddenly and violently erupted, not from it’s old caldera but instead by ripping a huge gash into the surface of the earth, six miles long by three miles wide, two and a half miles away. Bariloche, the town I found myself now, had been covered in a thick coat of ash. The tourist industry was predictably decimated and is still recovering as the volcano continues to belch out thick plumes of ash, enough to warrant closing not just Bariloche airport but also an airport the other side of the Pacific in Melbourne, Australia. Chile makes up part of the Pacific Ring of Fire and boasts a chain of about 2,000 volcanoes, the world’s second largest after Indonesia. Some 50 to 60 are on record as having erupted, and 500 are potentially active. Guide books bragged about Argentina’s Route of the Seven Lakes, I counted two, a grim haze hung across the land and a suffocating slate-grey membrane eliminated light and space, extinguishing the promise of pristine lakes and majestic mountains. The dank, sodden coat of ash filled crevasses, lined ridges and dowsed every mountain for miles, the hint of grey giving the only clue that this was not snow. The air was thick with the volcanic dust, the sun just a torchlight searching for distant targets through a foggy night, finding none. The wind didn’t lift the murk the way fog drifts skyward on the breeze, instead the air was thick and tepid, carrying with it more burnt earth in its gripe. Houses and trees had slate-coloured tops of powder, lorries sprayed the streets with water to wash away the gunk, cars drove with headlights on full beam and people shuffled along holding handkerchiefs to their mouths or wearing surgical masks. Ash was regularly cleared from the road and sat heaped up in huge soggy banks by the roadside. Eventually every part of me and my bike wore the sticky residue. My eyes watered, my mouth dried up and when the faint shadow of another cyclist brightened out of the gloom I realised my mistake, I wasn’t prepared for this at all. The figure was clad in a huge overcoat, donning a surgical mask, a broad rimmed hat and swimming goggles. North of San Martin the dust made way for undulating sheets of gold. This side of the Andes is an arid semi-desert, the mountains wrestle any moisture out of the atmosphere so it remains fresh and green in Chile, yellow and dusty in Argentina. I relish the kind of freedom that a life on a bicycle allows, I treasure the moments when I can abandon all my plans on a whim or after some sketchy advice from another cyclist. In San Martin, after two minutes with an Argentine biker, my schedule was upended and a new plan was coming together. The road map of this region looks like two interlocking trees, side by side. The trunk of the first is Chile’s main highway that connects most of the major cities up to Santiago and beyond, part of the famous Pan-American. The trunk of the other is Routa 40 in Argentina which runs the length of the country. Branches flow east and west, trying to connect but often not finding their opposite, an invisible obstacle, the Andes, won’t permit it. But a few link across, jerking left and right in violent erratic wiggles as they close in on the Andean peaks. I traced my finger over the network of rough roads, the long thin ends of the branches, trying to find vertical links, there were a few. I penned a rough route, my roads of choice were nestled high and deep in the Andes, where settlements were sporadic and wilderness king. 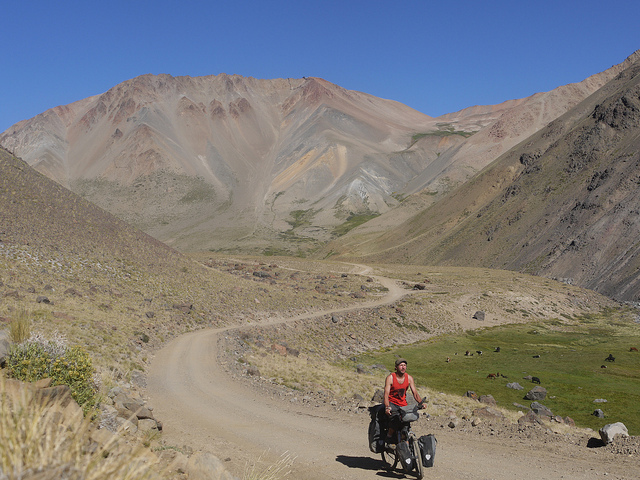 The loop I had drawn ran through seven national parks, nudged up against several volcanoes and finally delivered me back into Argentina via a remote, and not strictly speaking legal, Andean pass. Immigration didn’t exist here, I was destined to become an illegal alien in Argentina and I’d have to deal with that later. I would need a lot of food, the bike would be heavy, the road tough but the plan was simple, spontaneous, slap dash and full of optimism. The plan was perfect. So that was how I found myself set once again on a course bound for Chile and as I neared the borderlands the looming cone of stratovolcano Lanin was there to greet me. Lately I had been riding from tourist-ville to tourist-ville but now I was alone and I stopped every so often just to appreciate the stagnant, sublime silence. The failing sun cast its final rays over the cliffs, submerging the land in liquid gold and monkey puzzle trees became silhouetted against the colossal volcano creating an aura of pre-history. After the pass rural life played out over my handlebars. Mine were the only inquisitive eyes here, there was no reason for other tourists to come this way, that had been the reason to take this road in the first place. When I asked how many kilometres to the next village people just shrugged, they may have lived here all their lives but their answer came in how many hours it takes on a horse or an ox drawn cart, that was my first clue, I was getting off the tourist trail. When I ate lunch children would approach and begin a silent vigil, staring, intrigued but mute despite my encouragement (clue 2) and when I stopped to ask directions, a bunch of strange looking men grunted and smiled inanely (clue 3). Some years ago I guessed a brother and sister had gotten a little too close. This was Chilean hillbilly country. As villages became more and more scarce and I began to enjoy the increasing detachment, a truck pulled up. The passenger, a woman, began a rapid-fire babble in the harsh dialect typical of rural Chile. I strained to make sense of the torrent of words and gestures, she emphasised and repeated the important bits but never reduced the pace. I discerned a few bits of information, enough for vague terror to build. I wondered if they knew just how slow my battle down this bad road was, I wanted to explain that bicycles were not the best machines for outrunning volcanic eruptions. As they drove off, my mind raced. They weren’t the army. This isn’t an evacuation. I can’t see anything on the horizon. I should be OK. But whilst the thought process seemed vaguely logical it didn’t stop me glancing tentatively in my side mirror, half expecting to see the forest behind me rapidly consumed in pyroclastic soup. Finally I left cultivated land far behind me and cycled along Routa Interlagos, by evening I had found a campsite and had been adopted by the family in the tent next to me. I was the father’s nominated drinking buddy for the evening, he was a raging alcoholic. His family seemed relieved more than happy to have me there, probably just grateful that the mindless drunk was now my responsibility. Alcoholics are never the best people to test your language skills. If you make a mistake or can’t think of the right verb they do little to help aside from an arm around the shoulder and some slurring in a tone unintelligible to any ears. The next day I started into one of the National Reserves, it was clear this was real volcano country. Alert systems were in place on the outskirts of every town or village and signs advertised the risks. Soon I was amidst a surreal, black desert of basalt. The last eruption here was in 2008, they expect one every five to ten years. In the background to this bare arena were colourful hills, metal ores painted the rocks red, green and amber. Over lunch I sat admiring the volcano, sheltering from the wind behind a van with a camera crew taking photos for a European sport’s brand. The guide addressed the group “Just looking at him makes me exhausted!” gesturing towards me as everyone chuckled. 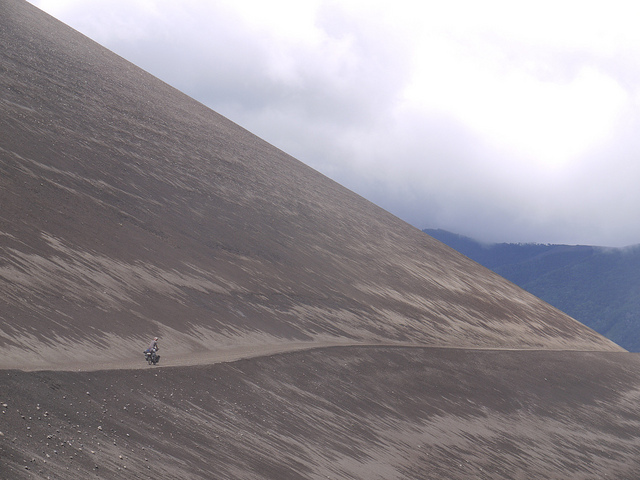 Alone, I descended over the other side of the volcano, the track became smaller, less distinct, soon barely traceable. I didn’t have a good enough map of the area to navigate properly. A brutal climb disappeared upwards, I began to push, for hours I continued onwards, shoving, dragging, panting. Every so often a river crossed the path, I had to dismount and carry my panniers over two by two. After an equally huge and steep descent I knew that turning back now would mean a gigantic effort. Soon came the inevitable questions, each filled with dread and unease – Is this right? This can’t be the way. Maybe I should of taken that left at the lake. What if… It was abrupt, that sense of vulnerability that seemed to sprawl out over the hills and mountains, bigger than the sky, further than the horizon, insurmountable and unbeatable. I realised then I was scared. The root of my fear lay in everything I didn’t know and could never know. Whether I had enough food, whether I was on the right track, how long until I got to a village, if I should turn back. I was scared too that I didn’t have it in me, physically and mentally. For two days I didn’t see another human being, deep in the Andes, scared and alone, every decision a burden, heavy in self doubt, and out here it was a lot to carry. Then finally through the trees I sighted a river and by the bank, a few tin houses. Suddenly elated I ditched my bike and ran to the bank, there was no bridge and it was too deep to wade across but a rickety basket attached to a pulley system would do the job. A man on the far side spotted me and over the next half an hour he helped transport my panniers and bike across the river. The relief was almost worth the panic and toil. I was back from the brink. I got some information from the locals, I was only thirty or so kilometres from the pass but then once again with no map, no signs, no people and no obvious route I had to freestyle my passage across the mountains. I waded through milky rivers with rocks stained yellow and where the eggy stench of sulphur swirled on the breeze, soon I began wondering once again if I was lost in the Andes, at junctions I would recce on foot and make a choice and if I was lost now, I was getting more lost. I tried to mark my route in case I had to backtrack. Horseflies plagued my every move, biting through my t-shirt. Even when swatted and convincingly dead the invincible critters re-inflate and fly away to torment me again. Things got tougher but I began to be hopeful I was on the right track, my compass agreed with me and the road. Fist-sized chunks of ancient volcanic debris littered the ascent and I slipped and landed heavily, bicycle on top of me. I lay still in the dust and began to laugh, suddenly everything was hilarious. I laughed that it had taken me three hours to cover ten kilometres, that I had been effectively lost for most of the last three days, that I was totally alone and that bikes don’t belong here. Finally I laughed at the fact that I was lying in the dust, under my bike, on a remote Chilean mountainside and could only guess where I was heading, because that probably shouldn’t be funny. It was a few hours later that I lumbered up another switchback, edged over another ridge and there before me, naked and clear, land in every direction, most of it beneath me. I had made it. This was the pass. I took a small stone as a souvenir and headed down through a peat bog, a lake and a faint silhouette of what appeared to be a hut were my targets. An astonished Mapuche farmer, perhaps believing I was an apparition or an evil spirit eyed me nervously. I has staggered onto his remote farm through a peat bog, dirty, grimacing, heaving a bicycle in front of me and probably groaning. In hindsight his expression made perfect sense. In Caviahue I sat for a whole day in a cafe, watching a violent thunder storm roll in, reading, writing, drinking beer and chatting to other customers only to find out with the aid of a decent map and some local knowledge that I had completely missed the pass I was aiming for, I had crossed another one, one not featured on my map or, as I found out later, on googlemaps. I thought about the nature of optimism, of how it can be a duplicitous beast. Without one side of the sword I wouldn’t have started my journey, to travel you need an undercurrent of positivity, the feeling that the world isn’t as perilous or angry as the media might have you believe, that chances are things will work out OK in the end, that it’s always possible and that the faint line on my map zigzagging over the border was doable on a loaded touring bike. But it was that same hope that had led me to a baron, lonely track, lost, with a redundant map not detailed enough to navigate. It was foolish, naive, blind faith. I had underplanned, I had carelessly pushed on regardless. Optimism doesn’t wait on facts. It deals with prospects. A healthy dose of pessimism leads to ‘what if… ?’ and then maybe a contingency plan. “If pessimism is despair, optimism is cowardice and stupidity. Without a Argentine stamp in my passport I could be in real trouble so my plan was to take another remote pass back into Chile making it appear that I had never left in the first place. Getting information about these passes is near impossible without some local knowledge. Hours on Google was time wasted so it was lucky when I met three more cyclists, one had come down from Alaska. 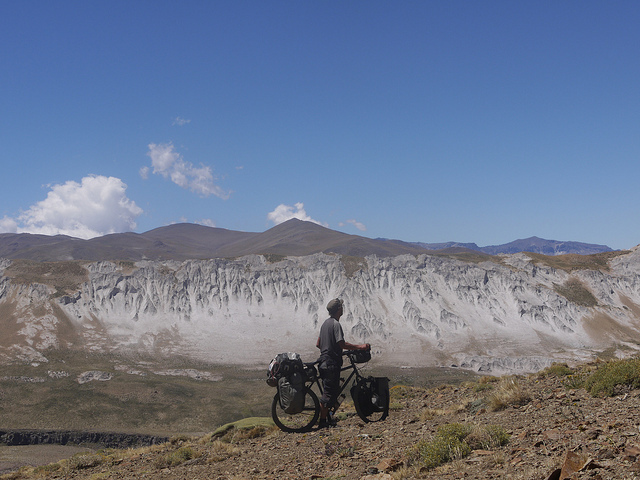 The message was that the pass was possible by bike, although they hadn’t come that way themselves. And more luck, just as I was readying to leave Malargue I met a dutch couple who had actually cycled the pass. Unfortunately there was immigration but I decided to go for it anyway. The couple drew me a map that looked as though it should describe the location of buried loot and was full of landmarks and instruction that only cyclists would consider relevent. There’s a strong sense of national pride in Argentina and the Argentinians are suckers for flattery, my plan at the border post was to exploit this quirk. I entered the small lonely hut which sat in the shadow of the mountains and served as immigration. I approached the official, firm handshake, eye contact and straight to business, schmoozing. That was it, he was putty in my hand. By this stage I could have surrendered a kilogram of uncut cocaine to the customs official and he would have winked and waved me through. Two minutes later he was reaching for the red stamp and I had “salida” across another page despite the lack of an “entrada”. When I reached the Chilean immigration post twenty kilometres later I realised that in his flustered state the Argentinian official had forgotton to give me the slip of paper I needed to gain entry into Chile. 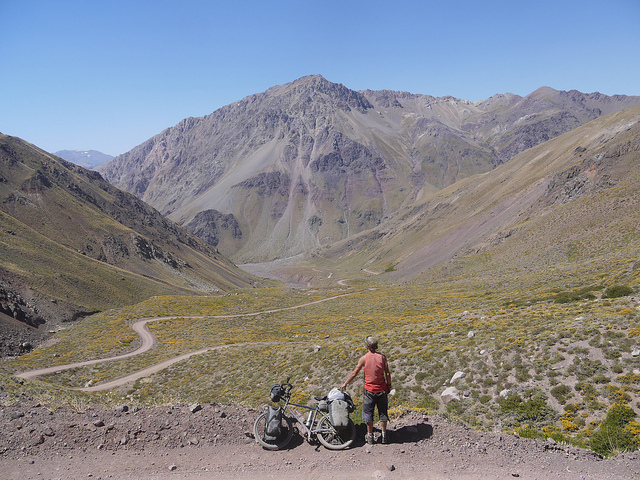 “I’m so glad to reach Chile, its much better than Argentina” I told the official and freewheeled down the pass into the green hills of the new country. The descent was a rapid rally through forested valleys with white frothy rivers and then into lowland central Chile where vast vineyards owned the panorama. 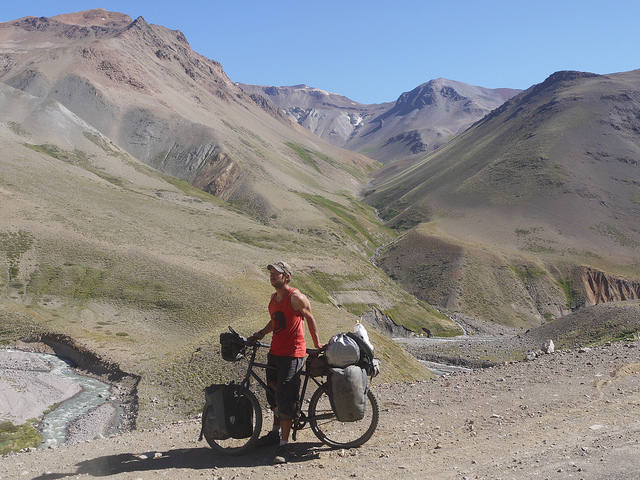 I cycled north on route 5 to Santiago, knowing that the Andes to my right were gaining in stature all the while. Every pass north of my next one climbs to over 4000 metres, but I know I’ll be back, The Andes are a prize and a punishment and one I can never refuse. My bike and my tent have suffered a bit lately as well and need some good repair work, but it’s all been worth it. Thank you to everyone who contributed to the cost of an IPOD so I have some banging tunes to listen to. 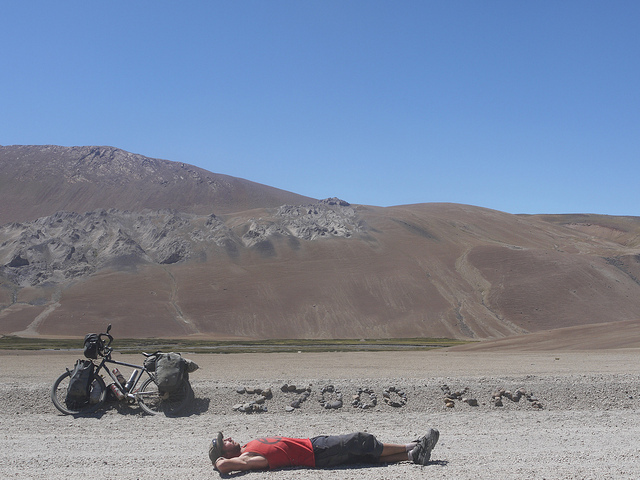 Next post will come from Argentina once again after (at least) one more mountain pass. wow, wow, wow!!! what an amazing run/cycle you have had! and how terrifying to be lost in the Andes with a volcano hot on your heels (excuse the very bad pun) :). Another brilliant post Steve. I feel like I have climbed those mountains with you, your descriptions are so good. The photos are as usual; fantastic. how barren is that landscape. wow!!! I cant even begin to imagine what it must be like to be so alone in such a large landscape. Loved the directions, poor dead cow! Sounds a bit like the kind of directions you would get in South Africa too. That poor farmer, I cant even begin to imagine what went thru his mind when you came stumbling along! hahaha. I guess the French and Italian Border Guards could learn a thing or two from the Argentinian and Chilean Guards…..at least you got some smiles! Try chatting to one of the European Guards…not advisable. Mind you the USA guards are even worse. Smile….and your'e on their 'most wanted' list! Thank you for a fantastic post, I am still very envious and totally admiring of your stamina and strength of will. This trip of yours, albeit fantastic must be a real drain on your resources from time to time. Bravo. Keep safe, have fun and I hope you don't end up under the bike again in too much of a hurry. You've got me humming some Jimmy Cliff here, only I'm singing "Many mountains to cross…" instead of "Many rivers to cross…"
So that scorpion under your sleeping mat? GULP. You remain the most entertaining blogger ever, son. We think of you often and are so appreciative that we get to follow this adventure with you. Traveling mercies to you. Such effusive and evocative writing from the usually taciturn author makes it even more compelling. I might just take u up on your offer to join u; it seems you have sufficient "foolish hope, naivety, blind faith, blended optimism,pessimism" and humour for 2. An amaing adventure. I was with your mom an George last night and we were wondering where you were! Keep up the excellent blogs. Proud to know you. What an adventure — so glad the volcanos decided NOT to erupt in your presence. A. "Stagnant… silence"? What is that exactly? 2. Who took the long distance photos of you if you were traveling alone? Especially the first one, "I'm the dot, riding across a volcano in Central Chile." One that´s not flowing or advancing towards volume?! Perhaps not the best choice of adjective! Nice one Steve- another fantastic post. When are you in Aus? I'm there now, it would be great to catch up with you? I have been reading your blogs since you left England. It amazing you have reach South America now. I really did enjoyed reading your adventure cycling through Africa and a lot of amazing photos.I shall keep on reading on your future blogs. Look forward on your next post.Keep it up. One of the best posts yet steve! really great to read about your trip – has partly inspired me to do LeJog/JogLe in a few months time followed by who knows where. Very Impressive images too – although I am still trying to work out how you took the photo at the top on this "solo" part of the trip. He addressed that in a upper reply.